This statistic presents a ranking of the ten most valuable U.S.-based internet companies by market capitalization. 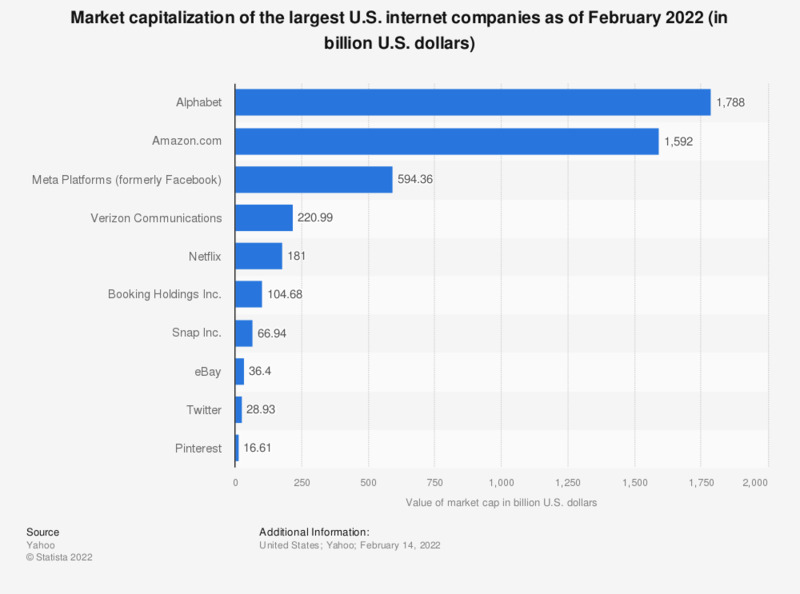 As of March 2019, Alphabet's market capitalization was 794 billion U.S. dollars. Second-ranked retail platform Amazon had a market cap of 789 billion U.S. dollars. Internet companies generate their revenue through various means. Google, for instance, makes use of its advertisement services such as Google AdWords – which takes advantage of Google searches and appear as small advertisements next to search results – and Google AdSense which generates advertisements based on a user’s search history and location, among others. Advertisements based on AdSense appear all across Google-owned sites including YouTube and Google Finance. The online company also profits from the development of Android OS, licensing and mobile apps as well as the recent development of hardware such as the Nexus mobile device series and Google Glass. In 2018, Google’s total revenue amounted to 136.22 billion US dollars. Social network Facebook is ranked third. It is the leading social network worldwide and has successfully managed to take advantage of the increasingly mobile online environment. In 2019, mobile accounted for 92 percent of Facebook's advertising revenues and is projected to amount to more than 60 billion U.S. dollars in 2021. Amazon.com, the second largest U.S. internet company based on its market capitalization, generates in profit from its position as the world’s largest online retailer; in 2018, the company’s net revenue was of some 232.89 billion US dollars. Despite operating internationally, Amazon generates the majority of its revenues in the United States and Canada. In 2014, Amazon’s North American net revenue was of close to 63.71 billion US dollars, with the majority of the revenue coming from electronics’ sales. Media sales (which include services such as Amazon Instant Video) amounted to some 12.48 billion US dollars.